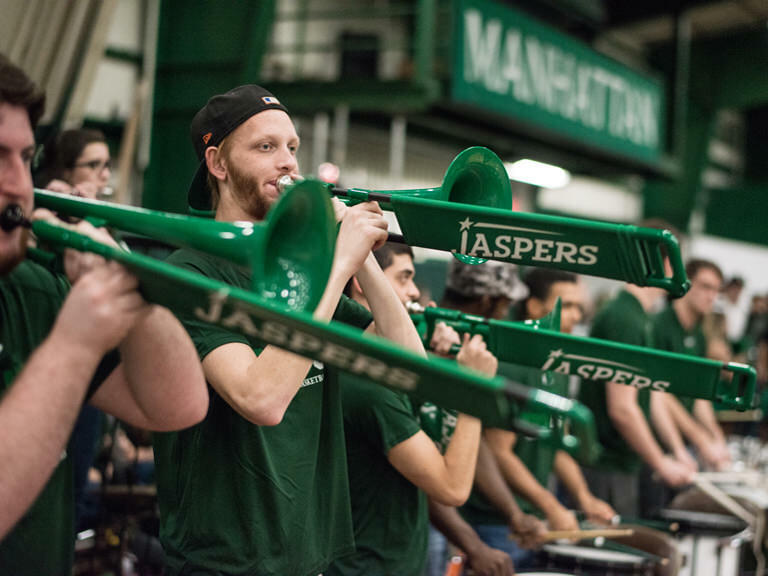 As part of the Spirit Squad, the Manhattan College Pep Band leads hundreds of screaming fans in spirited renditions of their favorite Top 40 hits during home men's and women's basketball games, post-season play and special tournaments. In the past, the Pep Band has traveled with the Jaspers to the MAAC Tournament, NCAA Tournament and other national events. Aside from their cheerleading duties, members of the Pep Band are headliners in their own right, performing at various concerts throughout the year. Musical experience is necessary to join the Pep Band. Auditions consist of a quick run through of some scales and a simple sight-reading of one of our songs from the previous year. Auditions typically last about five minutes. Most auditions are held at the beginning of each academic year, although others who want to join Pep Band during the semester can schedule an audition. All class years, including freshmen, are eligible to join. For more information, email jasperband@manhattan.edu.